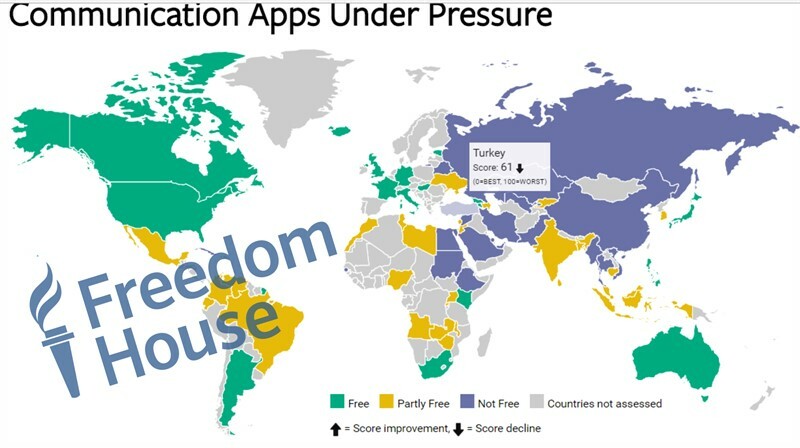 The report, which covers events between June 1, 2015 and May 31, 2016, concludes that A third of the world lives in countries where the internet is “not free,” while Turkey has been downgraded to “Not Free” for the first time. “Internet freedom around the world declined in 2016 for the sixth consecutive year, Two-thirds of all internet users – 67 percent – live in countries where criticism of the government, military, or ruling family are subject to censorship. Social media users face unprecedented penalties, as authorities in 38 countries made arrests based on social media posts over the past year. Globally, 27 percent of all internet users live in countries where people have been arrested for publishing, sharing, or merely “liking” content on Facebook,” the report said. The report also noted that Internet freedom declined in Turkey in the 2015-16 period amid network shutdowns, blocking of social media, lengthy prison sentences and nationwide cyberattacks. “Over 100,000 websites were reportedly blocked in the country as of 2016, including a wide variety of political, social, and religious content. Dozens of news agencies and social media accounts covering Kurdish issues have been either blocked or shut down for allegedly promoting terrorist propaganda over the past year. Journalists and even university students have been convicted on spurious terrorism-related charges and sentenced to multiyear prison terms, “said the report. Freedom house also noted that “insulting” public officials, particularly President Recep Tayyip Erdoğan, turned into the most common charge in the country as Erdoğan alone has filed criminal defamation complaints against more than 2,000 people since elected to his current office in August 2014. “Authorities hastily introduced gag orders on the dissemination of images and videos of the bombings, resulting in the blocking of hundreds of URLs. Access to Facebook, Twitter, and YouTube was repeatedly throttled until the companies removed controversial content. Specific hashtags related to the bomb sites, like #Istanbul, #Ankara, and #Diyarbakir, were temporarily filtered from Instagram. Counterterrorism operations in the southeastern region of the country repeatedly resulted in the suspension of 3G networks, affecting millions of residents for days at a time,” the report added. Turkey accounted for almost 90 percent of all content that was locally restricted by Twitter in the second half of 2015. Turkey’s regulator fined the company TRY 150,000 (US$ 51,000) for refusing to remove what it termed “terrorist propaganda” from the site.